Roses in containers are available (5.5 litres containers). They are only shipped to France until October 2019. Shipping of bare root roses is over. It will resume by the end of October 2019. You can already pre-order your bare root roses. They will be shipped by the end of October 2019. Bottles of our natural Rose Water (Rose Hydrosol), are still available. Discover all the benefits of rose water in the Rose Water section. Obtenteur : Bentall in 1937. Fleur : pink with white center, simple. Hauteur : 1,2 to 1,5 m.
All our shipments are made by Colissimo la Poste 48 hours. It is in 1845, in Lyon, that Claude Ducher organised the first world exhibition ever dedicated to the queen of flowers. 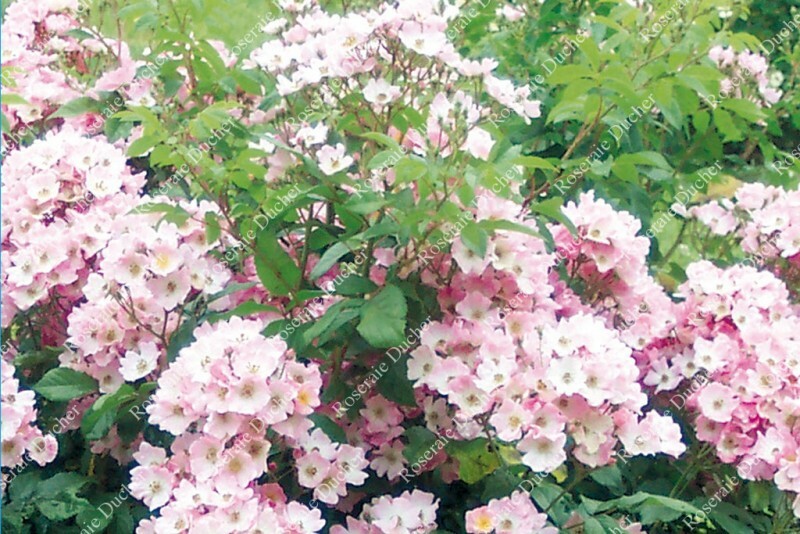 The same year, he created his rose nursery and will be internationally recognised. Ducher's roses have gone through the centuries: 'Marie Van Houtte', 'Reve d'Or', 'Gloire de Ducher', 'Ducher', 'Mademoiselle Cecile Brunner', and many others are still cultivated all around the world. Continuing the family tradition, Florence and Fabien Ducher carry on the tradition of creating unique and marvellous roses, sharing professional expertise to keep your rose garden beautiful and vibrant for years to come.